Tulalip, Washington — Bubbles and Fries will be all the craze at Tulalip Resort Casino starting November 30 through December 30, 2017. Executive Chef Perry Mascitti and Sommelier Tom Thompson have teamed up to share their two favorite food and drink combinations in a uniquely inspiring way. Whether it’s the Build-Your-Own Poutine Bar at Eagles Buffet or the Twice-Baked Potato Fries at The Draft Sports Bar and Grill, guests are encouraged to partner these tempting French fry preparations with a glass of bubbly. For Mascitti this month-long event is all about the salty fries, and for Thompson, it’s all about the elegant contrast of these sparkling wines paired with these savory treats. “I want everyone to try it once by taking a fry, placing it in their mouths and following it with a sip of bubbly to experience this food revolution,” shares Executive Chef Perry Mascitti. In fact, it was somewhat of a potato war. The Tulalip chef team deconstructed them, sauced them, relished them, cut, and creatively cooked them…all in an effort to spark a newfound love affair worth their weight in gold. Full menus and additional dining information are available at Cedars Cafe, Destinations Lounge, Journeys East, The Draft Sports Bar and Grill, Blackfish Wild Salmon Grill, and Eagles Buffet. Shhh…a New Year’s teaser about what will be happening in January. It will be about spirited cuisine, which will start on January 2, 2018. Stay tuned! Bratwurst, sauerkraut, and beer. Sounds fun doesn’t it. That and more is what you can expect at the Oktoberfest celebration as part of the Taste of Tulalip in WA state. Below is the announcement about the festival. Have fun! Tulalip WA — Holding true to Tulalip Resort Casino fashion, the culinary team will draw from the original Munich Oktoberfest for their first annual Taste of Tulalip Oktoberfest on Friday, September 22 from 6 pm to 9 pm at The Draft Sports Bar and Grill Patio. Sommelier Tom Thompson and Executive Chef Perry Mascitti will showcase authentic German dishes along with imported, local, and domestic Oktoberfest inspired beer at the enjoyable Taste of Tulalip celebration. Tickets are priced at $45 per person, ages 21 and over. The Draft’s Chef Brent Clarkson carefully prepared the menu with options including hearty platters of Uli’s Famous Brats and Sauerkraut, Beer and Cheese Soup with Bavarian Pretzel Crouton, and a traditional Spätzle Bake (German Spätzle pasta lightly buttered and layered with Black Forest ham and Emmenthaler cheese topped with caramelized onions). Rounding out the selections are a Savory Bavarian Pretzel Bread Pudding with mustard caraway rye cream, Pork Schnitzel “Pops” topped with bacon and wild mushroom cream sauce, and a Cheese and Wurst Display, featuring traditional German frankfurter and classic Weiss Wurst sausages (served with an assortment of cheeses, pickled vegetables, gherkins, and breads). Tom Thompson’s team will serve up a grand selection of beers from noteworthy breweries featuring: Backwoods Brewing, Deschutes, Dru Bru, Georgetown Brewing, Leinenkugel’s, Sam Adams, Sierra Nevada, Hofbräu, Paulaner, and the Hacker-Pschorr. During the evening’s festivities, guests can take their chance with lady luck and enter to win from one of two raffle drawings. The two prizes will each include two tickets to the Robert Cray show on November 17, 2017, one overnight stay at Tulalip (some restrictions may apply) and a $100 dining credit applied to the winner’s room. Doors open for the Taste of Tulalip Oktoberfest 2017 at 6 pm and tickets are priced at $45 per person all-inclusive. To purchase tickets, call (360) 716-1625. All attendees must be 21 and over. Cedars Cafe will serve Bavarian style Wiener Schnitzel with warm sweet and sour coleslaw, mashed potatoes; topped with crispy onion straws, lemon beurre blanc, and blackberry sauce. Dessert includes Cedars’ Black Forest Ice Cream Sundae with chocolate ice cream, Kirsch cherry compote, whip cream, and chocolate shavings. Blackfish Wild Salmon Grill presents their Seared Apple Marinated Duck Breast with apple-duck demi & Thuringer sausage with apple-mustard demi, along with onion potatoes, green beans, red cabbage and bacon and a dessert featuring Apple-Raisin Strudel with vanilla bean ice cream. Carvery/Hotel Espresso makes their mark with Bavarian Ham Sandwich Black Forest ham on a fresh Bavarian pretzel roll, Munster cheese, dill pickles, and stone ground mustard. The Draft Sports Bar will offer Pork Schnitzel Pops bite sized pork thinly pounded, skewered, breaded, fried golden brown and topped with bacon and wild mushroom cream sauce. Served with warm bacon potato salad and braised apple and red cabbage. Tulalip Bay’s menu is embellished for the season with Spicy Sausage and Truffle Potato Fritter with stone ground mustard sauce and a dessert of Linzer Torte with beer ice cream. Eagles Buffet will offer Amber Ale Braised Beef Brisket with buttered Spätzle in September and Bavarian Pork Ribs with braised red cabbage in October. For more information about Oktoberfest 2017, visit TulalipResort.com. Don’t forget to wear your lederhosen! If you are in Washington state, or a BC person going to WA on Saturday, Feb 25, and you like wine, you may want to attend this winemaker’s dinner at 9 Restaurant located at the North Bellingham Golf Course. Here is the press release. Saturday, February 25, 2017 at 6:00 p.m.
Reservations are available now for Whatcom Northwest Wine Festival’s second annual fundraising dinner. The 90+ Winemaker’s Dinner Fundraiser will feature five northwest wines—all 90 points and above. Award winning Executive Chef Nick Moss has prepared a menu to pair the unique wines with a festive five course meal. The night will be moderated by Dan Radil, also known as Dan the Wine Guy. Guests can also participate in a silent auction and raffle. Reservations are required and made by calling 9restaurant at (360) 398-8300 extension 2. Growing Veterans, Lydia’s Place, Our Treehouse, Pass the Hat, and Brigadoon Service Dogs. Whatcom Beer and Wine Foundation raises funds for human and social services non-profits in Whatcom County. The festival is produced by The Whatcom Beer and Wine Foundation. Details: For 55 years, Rodney Strong Vineyards have been pursuing the passion of winemaking deep within California wine country’s Sonoma County. Today, the winery continues to emphasize the art of winemaking, but with a modern twist. Three families have contributed to the vineyards’ reputation for critically acclaimed Single Vineyard and Reserve wines, starting with Rod Strong who established the winery in 1961. At the time, it was the 13th winery in the wine industry in Sonoma County. A few years later, Rick Sayre became winemaker in 1979. Then came the Klein Family who purchased the winery in 1989 as fourth generation California farmers. Today, Rodney Strong Vineyards still stands out as one of the best varietal wines in the area producing 12 wines utilizing the winery’s 14 vineyard estates. Among those varietal wines are Cabernet Sauvignon, Chardonnay, Malbec, Meritage, Merlot, Pinot Noir, Port, Rosé, Sauvignon Blanc, Syrah and Zinfandel. Semiahmoo Resort’s Rodney Strong Vintner Dinner begins with Chef Bruno Feldeisen’s warm spot prawn Waldorf Salad with smoked ikura roe, paired with the 2015 Charlotte’s Home sauvignon blanc. The second course features roasted Neah Bay sablefish with a cauliflower puree and brown butter, paired with the 2014 Chaulk Hill chardonnay. The third course consists of Sage and Sky Farm lamb and black truffle meatloaf with sweet-onion soubise and fennel confit paired with the 2013 Symmetry Reserve meritage red. The fourth course includes a carved Wagyu Beef tenderloin with black garlic, Foie Gras and rosemary jus paired with a 2013 Alexander’s Crown Vineyard Reserve cabernet sauvignon. To finish the meal Chef Feldeisen will serve his homemade tiramisu ice cream with espresso sauce and pistachio meringue for dessert, paired with the 2009 A True Gentleman’s port. Tulalip, Washington — On Saturday, November 14th, get up close and personal at the 7th annual Taste of Tulalip Rock and Roll Challenge, where three chef/sommelier teams will face off for the ultimate, fun-filled 30-minute cooking and wine pairing showdown—Iron Chef Style. So hold on, as this will be a fast paced culinary roller coaster with slammin’ Rock and Roll music, where each team of two chefs and one sommelier will combine talents to turn out the ideal entrée or appetizer from their mystery box. The dish will be paired off with a wine selection that the sommeliers will “hunt” for at the Grand Taste in the Orca Ballroom. During this year’s competition there will be a total of three cooking “twists and turns,” which is sure to keep it lively and edgy. Each team will consist of one local Chef, one Tulalip Chef and one local Sommelier. This year’s local guest chef lineup includes Toby Jensen, The Ruins Seattle; Eric Truglas; and Dean Shinagawa, Kama’aina Grindz; along with Tulalip Chefs Nikol Nakamura, John Jadamec and John Ponticelli. The Sommelier gang will be comprised of Chris Horn, Purple Cafe Seattle; Dawn Smith, John Howie Steak; and Kristin Young, Bastille Cafe and Bar. The three “mystery boxes” will contain the ingredients for each team, which will be a well-guarded secret from all of the participating chefs. The boxes will measure the size of an apple crate and will be filled with identical ingredients. After opening it, each team will be given up to five minutes to discuss the cooking preparation with their teammates, and then each team will have 30 minutes to create the perfect dish. While the chefs are preparing their food, the sommeliers will search the Grand Orca Ballroom for the ideal wine pairing. The three identical Albert Lee Appliance — Thermador and Bosch kitchens will be set up with the needed commercial tools and cookware. This will include (tested and powered) blenders, burr mixers, Kitchen Aid mixers, food processors, gas cooktops, ovens and refrigerators, and all the necessary hand tools as well as plenty of standard knives. Also, pads of paper and pens for menu creation will be provided for each kitchen. At the end of the challenge, the audience and celeb judges will vote on the best food and wine pairing between the teams. The five honorary judges (Guest Chef Chris Cosentino, aka @OffalChris, is the Chef/Owner of Cockscomb and Boccalone; Chef Thierry Rautureau, Loulay Kitchen and Bar, Chef T, Rione XIII, Culinary Expert Mauny Kaseburg, and one member from the audience) will taste and vote for two team finalists and the audience will vote for the winning first place team using the three different Le Creuset utensils. The judges’ votes will be based on food presentation, creativity, utilization of the mystery basket, and best sommelier wine pairing. Once the votes are counted, the winning team will be announced. All of the competitors will leave with some nice prizes and one team will leave with bragging rights! The 7th annual Rock n’ Roll Challenge takes place during the Saturday, November 14th Grand Taste Event with doors opening at 3:30 p.m. The cooking challenge starts at 4 p.m. and the event is open to all “Grand Taste” and “All Access” pass holders, and will be held in the Taste of Tulalip Event Pavilion. Taste of Tulalip 2015 sponsors include: Delta Air Lines, Albert Lee Appliance – Bosch and Thermador, Dillanos Coffee, Mercedes-Benz of Lynnwood, Coke, Le Creuset, Seattle Magazine, and Tasting Room Magazine. I love this event. Enough said! Get your tickets asap. 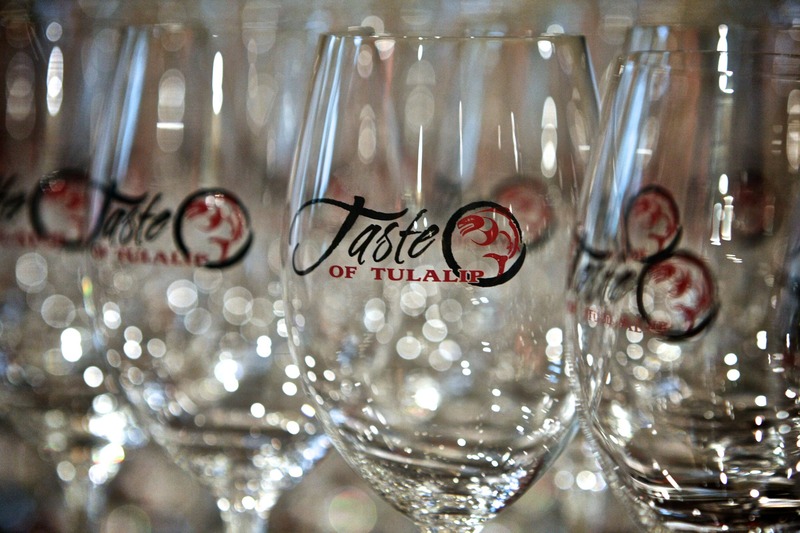 Tulalip, Washington — Tickets for the 7th annual Taste of Tulalip, held at the Tulalip Resort Casino, will go on pre-sale at 9:00 a.m. PDT on August 14, 2015. Executive Chef Perry Mascitti and Sommelier Tommy Thompson have spent the past year organizing a star-studded line-up of food, wine and traditional show-stopping entertainment for ticket holders. Run, don’t walk, when purchasing your passes because this highly anticipated event sells out every year. Seats for the Friday, November 13 celebration dinner may be purchased by calling (360) 716-6888, and the passes for the Saturday, November 14 events can be purchased via Ticketmaster atwww.ticketmaster.com. The 2-day festival, with a focus on wine, food and tradition, begins with the Friday night wine and passed hors d’oeuvres reception, followed by the fittingly named Celebration Dinner. The multi-course repast celebrates “La Famiglia,” as the Italians say, it’s all about “the family!” The evening’s inspiration comes from the love of Italian grandmothers everywhere who have a special passion for cooking amazing food every day for their families. In tribute, Tulalip chefs will recreate many of their beloved recipes, paired with a global offering of rare, top wines. Friday night’s Celebration Dinner is priced at $225 per person, and tickets are limited. On Saturday “All Access” pass holders ($350 per person) will enjoy early entrance to the unforgettable Grand Taste and Rock and Roll Challenge; a wine seminar — Washington State AVA Smackdown featuring some of the State’s tops wine producers, hosted by superstar wine guy, Anthony Giglio. Also featured, a VIP seminar featuring Chef Chris Cosentino’s cooking demo, table talk and Q & A session on the Albert Lee Appliance Cooking Stage; and a private Magnum Party where guests will be treated to a selection of high level wine and food pairings. The weekend’s highlight is always the Grand Taste, spanning four hours and featuring lavish food stations, as well as over 100 wines from Washington state, Oregon, California, Oporto, Maderia, global selections of bubbles, as well as pours of late harvest and ice wines and craft beer. Grand Taste is priced at $110 per person and includes the edgy Rock -n- Roll Cooking Challenge – a fast-paced culinary roller coaster with slammin’ rock and roll music! Expect fun and great tunes as local Seattle and Tulalip Chefs and Sommeliers compete “Iron Chef” style with celebrity judges (Chef Chris Cosentino, Chef Thierry Rautureau, Chef T, and Mauny Kaseberg), who are looking for the best dish and wine pairing. This year’s emcee will be the famously entertaining Chris Cosentino from San Francisco’s Cockscomb and Boccalone, along with wine writer, educator and raconteur, Anthony Gigilo. This show-stopping cook-off is sure to keep things lively and the chefs on their toes! To top off the weekend, Thompson will also feature an in-depth reserve wine tasting/seminar called “Turning Water Into Wine” with Sparky and Sarah Marquis of the award-winning Australian winery, Mollydooker Wines. The tasting line-up will include 12 of Mollydooker Wine’s recently released 2014 wines. Tickets are priced at $125 per person and are available for purchase by calling (360) 716 1239. Tulalip Wine Director Tom Thompson is always first in line to uncork the latest and greatest boutique finds. He has carefully selected well over 100 pours from Washington, Oregon, California, Germany, and New Zealand for the “Wine Event of the Year”, as recognized by the Washington Wine Commission. Thompson continues to add breadth to Tulalip’s extensive cellar, garnering Wine Spectator’s Best of Award of Excellence. Executive Chef Perry is the man behind the pan! He oversees seven dining venues, in-room meals for the Four Diamond hotel and catering for the entire Resort Casino. His creativity shines along with that of his culinary team at the multi-course Celebration Dinner, the nibbles of endless proportions at the Grand Taste, and he is the mastermind behind the Rock and Roll Challenge. Chris Cosentino, aka @OffalChris, is the Chef/Owner of Cockscomb and Boccalone and an Award-Winning Chef and Cookbook Author. Cosentino is a graduate of the culinary program at Johnson & Wales University and went on to build his résumé at Red Sage in Washington, D.C. and Rubicon, Chez Panisse, Belon, and Redwood Park in the San Francisco Bay Area. Cosentino took his first executive chef position at Incanto in 2002 where his inspired and innovative interpretations of rustic Italian fare promptly earned the restaurant both critical and popular acclaim. Cosntino’s debut on BRAVO’s “Top Chef Masters” series was a huge success earning over $140,000 for the Michael J. Fox foundation for Parkinson’s research and being named the season four winner. And in 2012, he saw the debut of his first cookbook “Beginnings: My Way to Start a Meal”. Anthony Giglio is a writer, educator and raconteur who motivates countless imbibers to trust their own tastes and relax the rules. Giglio’s witty, unpretentious style can be discerned in the weekly column he writes for Details Magazine’s “Food + Drinks” section. He has written 10 books, including three editions of the annual FOOD & WINE MAGAZINE Wine Guide review of 1,000+ wines; five editions of the enormously popular Mr. Boston Official Bartender’s Guide; and his highly-regarded first book, Cocktails in New York. Native American artist Michael Gobin meticulously uses his hands and knives to carve the Pacific Northwest’s indigenous red and yellow cedar trees in an effort to bring the sacred wood back to life. A treasure to the community, Gobin skillfully resurrects Tulalip’s traditions and ancestral stories through his works of art. After earning her Engineering degree, Shiels worked for two years in Torino, Italy, and then moved on to Case New Holland’s world headquarters in Chicago for 18 months before entering the world of wine. From there, Kerry worked the 2006 vintage at Joseph Phelps Vineyards, 2007 harvest at Australia’s Tahbilk, and then went on to work the 2007 vintage at Folio – Michael Mondavi’s Napa winery. During the 2008 harvest, Shiels served as the assistant white winemaker to Rich Arnold at Robert Mondavi Winery, followed by the antipodal 2010 harvest at Tapiz in Argentina, and then finally returning home to work full-time at Côte Bonneville. Having grown up in the Pacific Northwest, Bill feels privileged to chronicle the issues that affect his community. A newsroom leader, he has anchored and reported in the Seattle area since 1998, and is co-host of This Morning on Q13 FOX News weekdays from 7 to 10 a.m. Offering commentary on major news events from all over the world, Wixey has reported from Asia following the 2004 tsunami, from Haiti after the 2010 earthquake and covered the Olympic Games in Beijing, Vancouver and London. He has been honored with two Emmys for his broadcast work. A Seattle native and proud University of Washington grad, Kaci picked up her first microphone as a sophomore, and hasn’t put it down since. She got her start in radio at KISS-FM, to meeting the big brothers she never knew she wanted as host on The Bob Rivers Morning Show. In 2009 she joined the Q13 This Morning as a features reporter and is now co-anchor. Voted “Best Local TV Personality in Western Washington”, Aitchison is also one of the lead singers with local rock and roll band Spike and the Impalers. Mauny Kaseburg is a Northwest-born, Paris-trained food and wine consultant who many will remember from her many years on KUOW radio. 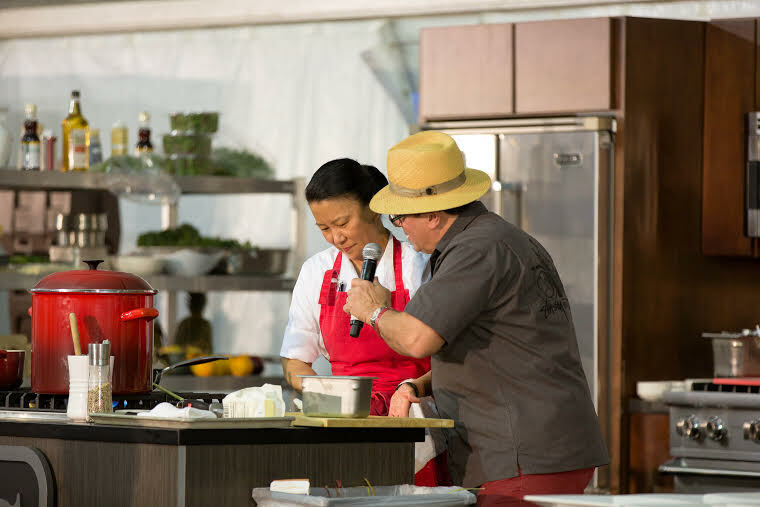 In 2015, Mauny celebrated her 28th year as Culinary Producer for the Food & Wine Magazine Classic in Aspen. Mauny also spent five years in the Northern California wine country, serving as Marketing Director for the Russian River Valley Winegrowers. She returned to Seattle in 2008 to marry the merman of her dreams – Geoff Golden. Savuthy Dy is a graduate of the California Culinary Academy and has worked at The Herb Farm, Qube, Piola y Crota in Italy, and Book Bindery, among others. Rock and Roll Challengers beware – Chef T was on the 2014 Taste of Tulalip Rock and Roll Challenge winning team. Taste of Tulalip tickets go on sale August 14, 2015. Hotel rooms and spa appointments will become near and dear during this 2-day extravaganza. Reserve a room at the AAA Four Diamond resort by going to www.tulalipresort.com or by phoning 1-866-716-7162. For more information, visit www.tasteoftulalip.com. The 2015 Taste of Tulalip sponsors include: Delta Air Lines, Albert Lee Appliance – Bosch and Thermador, Dillanos Coffee, Mercedes Benz of Lynnwood, Coke, Le Creuset, Seattle Magazine, and Tasting Room Magazine. Kirkland, Washington — On Sunday, September 21st, Le Grand Bistro Americain proprietor Ted Furst and Executive Chef Shawn Martin will be hosting a special 5-course dinner featuring 7 wines from South Africa, where wine has a history dating back more than 350 years – possibly the oldest wine tradition in the New World. Joining them will be winemakers Paul Cluver of Cluver Wines, Angela Jordaan of Jardin Wine Estates, and Kathy Jordan of Radford Dale, to share stories about their “wine farms” and the status of winemaking in South Africa today. The event starts at 6:00pm with a reception in the South Dining Room, followed by dinner at 6:30pm. Attendees will also have the opportunity to purchase wines from the dinner at special reduced prices. The South African wine culture has grown parallel to the country’s social development. While they are 7th in the world’s wine production, their output did not have a presence in the USA until the 1990’s after apartheid ended, due to product boycotts. Paul Cluver is a family-owned, family-run wine business, located in the cool-climate Elgin Valley, approximately 70km south-east of Cape Town. The property has been in ownership of the Cluver family since 1896. Recognized as pioneers of wine in the area, the focus is on producing elegant wines that are expressive of the terroir. Gary and Kathy Jordan have been making world-class wines since 1993 on a farm with a 300 year-old history. He’s a geologist; she’s an economist. Gary’s parents bought the 146 hectare Stellenbosch property in 1982, and embarked on an extensive replanting program, specializing in classic varieties suited to the different soils and slopes. Jardin is the trade name for Jordan Wine Estate in North America. Radford Dale combines modern winemaking and traditional values to create some of the finest, rarest wines in the Cape. These wines are strongly site-driven, natural and balanced. This world-class range is made with the utmost care and in exceedingly limited quantities. The dinner is priced at US$120 per person (7 glasses of wine and 5 courses! ), excluding tax and gratuity. Seating is limited. For reservations call 425-828-7778. Upcoming Le Grand Bistro Americain special wine dinners are presently scheduled for October 16, December 4; January 29 and February 26, 2015. Here in Vancouver, BC we typically think about wines from BC, but just a short drive south to Washington state, you can also find wonderful wines. A great way to get an introduction to Washington State wines is to attend Taste Washington, a yearly event held in Seattle. 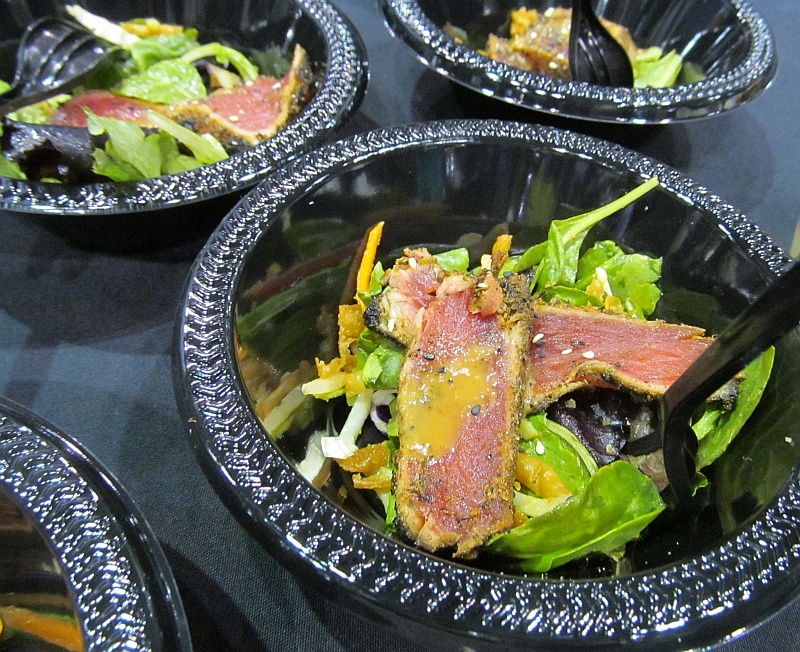 The 17th annual Taste Washington event is scheduled for Saturday, March 29 and Sunday, March 30, 2014, at CenturyLink Field Event Center. 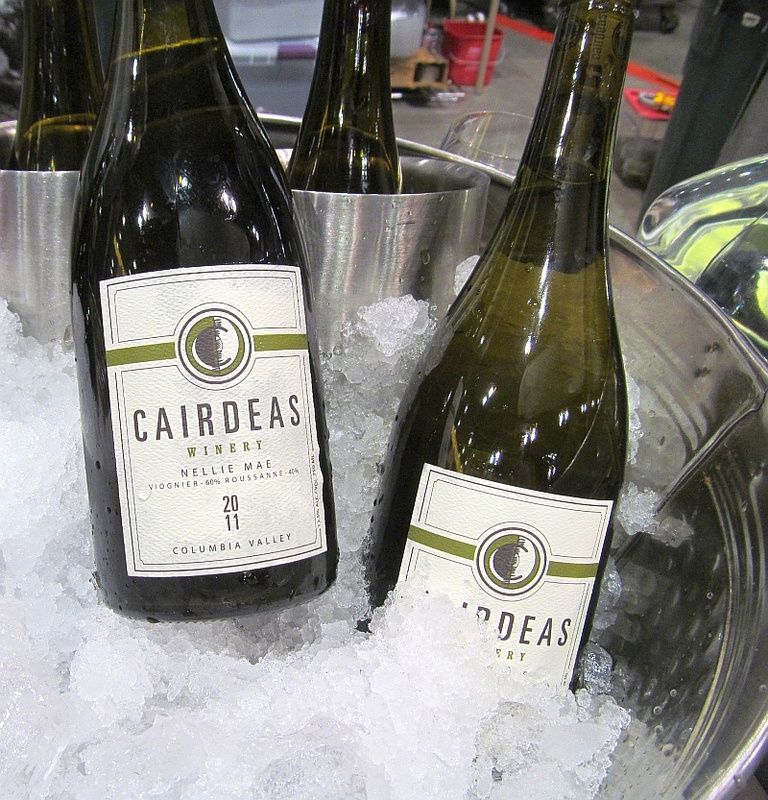 I have been attending Taste Washington for a few years, and learn alot about the wines. Instead of driving across Washington state to try different wines, or visiting clusters of tasting rooms in Woodinville, the wineries come to you at Taste Washington. If you are a lover of Syrah for example, you could sample and compare the wide range at this event, and finding out which wineries match to your palate. All in one day. On your own, it may take a whole summer of driving around Washington state to taste the same number of Syrah. Also you can also go back to a winery table and re-taste a wine to compare with another wine. A real fun, learning experience. I encourage you to buy your tickets for this event before it sells out. See you there!